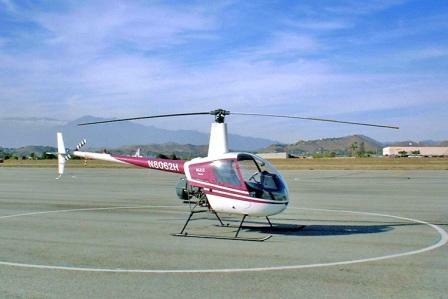 The Robinson R22 can legitimately be considered the Piper J-3 Cub of the helicopter world, it made piston engine private helicopters feasible for the private (albeit wealthy) owner. While Bell 47s, Enstroms, Hillers and Schweizers all are piston helicopters too, none of them are as economical to own and to fly as the Robinson R22. This isn’t to say the other helicopters are great machines in their own right—they are—but they are more expensive and have not obtained the “J-3 Cub” status that the R22s have. Frank Robinson was (and remains) the driving force behind the Robinson designs and work on the R22 began in 1973. By 1979 the R22 was flying and it very soon thereafter became the most popular helicopter in the world. It was designed to be a simple and efficient 2 seat helicopter that would operate 2,200 hours before major components needed to be replaced. In the realm of small, piston-engine helicopters, this was unbelievable longevity. The major components on the R22 proved to be durable and trustworthy, making the long overhaul period a reality. This was in no doubt helped by the selection of engine, the R22 is powered by the legendary Lycoming 0-320 engine. This is the same engine as used in some Super Cubs, Cessna 170s and 172s. In aircraft it regularly obtains flight times in the 3-4,000 hour range before major overhaul. In the bush the R22 is used for a variety of missions, from pipeline patrol, aerial surveys and wildlife studies just to name a few. As mentioned earlier, the economics of the R22 make it a feasible helicopter for many tasks that other helicopters simply could not do and turn a profit. Before the R22, Schweitzer and Bell 47s found some use in the bush, but they were not used as extensively as the R22 has been. If the Lycoming engine and major component durability are the strong points of the R22, its Achilles’ tendon is it flying characteristics. Two things are fair to say about the R22’s flight characteristics (1) they can be flown safely and are not nearly as difficult to fly as rumored, and; (2) they are quite a bit worse flying than practically any other helicopter. What this means is that to fly an R22 takes some training, and one should not expect to transition directly from a Schweitzer 300 to an R22 without a hitch. It takes a little while to get accustomed to the R22 and it seems a great deal more sensitive on the controls for most pilots flying it for the first time. However, once a pilot becomes accustomed to it, the R22 is an okay flying machine, and despite what you may have heard, the little R22 doesn’t drop out of the sky just for the helluva it. While aggressive training and maintenance have made Robinsons safe, the R22 overall safety record is not the best and some people will not have a thing to do with the Robinson choppers. In the authors opinion, a properly maintained R22 flown by a competent pilot is a safe as anything available and much safer than many homebuilt helicopters. Inside, the R22 is fairly cramped and business oriented. It is not a big helicopter and there is no luggage space except for the space located under the two seats. If you are the sort that want to smuggle hamsters, and your operation requires vertical flight, an R22 might be perfect for you, otherwise, know that you’re just not going to be able to carry much in an R22 under the seats. 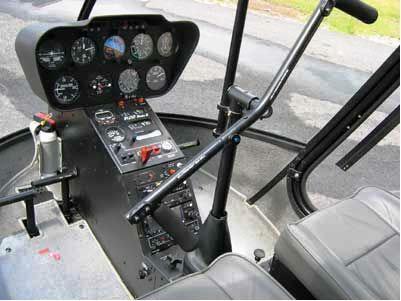 Once seated, the R22 is roomy enough and the controls are well thought out and placed. The control bar is on a teetering bar (helps with getting in and out, particularly with two people). The Robinson helicopters feature a governor that automatically matches engine power to rotor speed (in most other piston helicopters the pilot has to manually adjust this). Pilots who only fly Robinsons tend to be weary of helicopters without a governor, but they need not be, as correlation takes care of the bulk of this work on non-governed helicopters. R22s need to be overhauled at 2,200 hours of flight time and this overhaul is quiet extensive and expensive. At 4,400 hours an even more extensive (and expensive) overhaul is completed and at this point, the helicopter is considered new. And while these overhauls are expensive, they are less often (and less money) than maintenance on other piston helicopters. Because of the expense involved in these overhauls, the price of an R22 is more directly tied to TBO (time between overhauls) than perhaps any other aircraft. Occasionally R22s can bee seen on the internet for sale for $30-50, 000.00 but these are invariably timed-out R22s that will need extensive overhauls to make them airworthy. Finally, these overhauls are mandatory; it is technically illegal to fly an R22 beyond the time limits “on condition” as many airplane engines are flown when they reach TBO. The video features a Robinson R22 helicoper flying through a small canyon in Drakensber, South Africa. Very nice landscape. This is a nice video interview from Bill Robinson who speaks on the history of the Robinson helicopter. It includes a tour of the helicopter factory in Torrence, California.